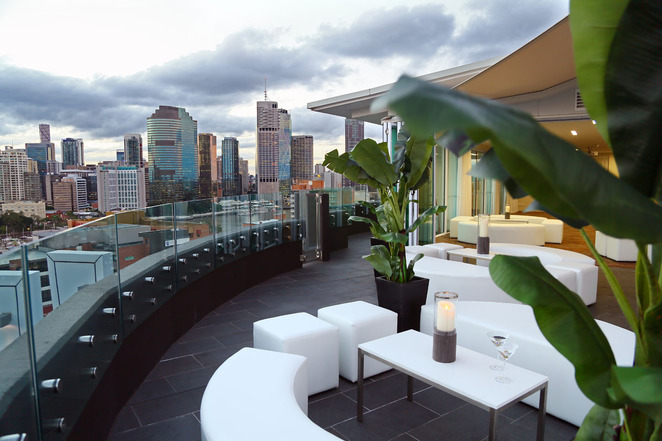 Panoramic views of Brisbane, classy décor and the best bubbly are all hallmarks of Brisbane's latest and greatest rooftop bar experience, Eagles Nest. It's the newest addition to Kangaroo Point based hotel The Point. Open from 4pm each Sunday, Eagles Nest features live music by duo 3rd Above, who create a wonderful ambiance. By day it's magnificent, but Eagles Nest really comes alive with glorious twinkling city lights of a night. No matter when you visit, you can enjoy the exclusive Moet "Ice" Imperial - the first Champagne created to be served on ice. If champagne isn't your style, try their range of contemporary and classic cocktails, a comprehensive wine list and local and imported ales. This top floor destination is definitely a great place for a romantic seduction or special event or occasion. Décor is modern minimalism, with symmetrical white leather ottomans set against a dark tiled floor and pops of green potted palms. If Eagles Nest sounds like your style of Sunday afternoon, take the elevator to the top floor, and prepare to have your breath taken away by Brisbane's beauty.